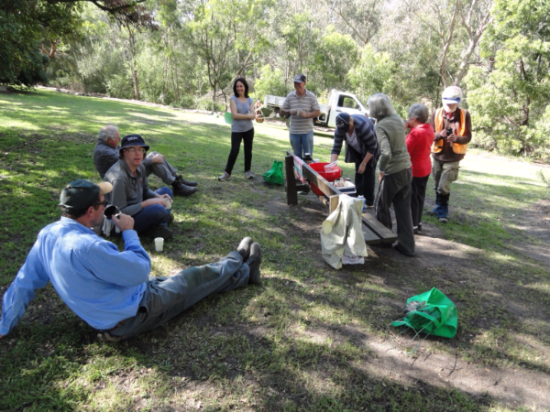 Our last working bee will be held on Sunday 30 April 2014, our last one for the year. Meet at 10.00 a.m. at the big bridge. Everyone is welcome to come to celebrate a good year's work with a couple of hours of weeding (not mulching as previously advised). Afterwards we will all go to Maggie and John's house for lunch. Bring something to share, such as snacks, salad or sweets, and your own meat and beverage. Tea, coffee, crockery and glasses will be supplied. Maggie will have an esky on site for any perishables while you are at the working bee. Contact Pam, 9830 5178 for any further information. Our last Tuesday working bee will be on 16th December followed by lunch at Café Biscotti. Work will resume on 3rd February, 2015 in Zone 1 and Stuart is coordinator. 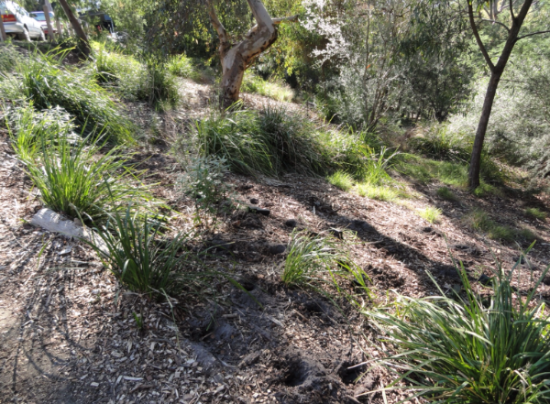 Our next working bee will be Sunday, 26th October at 10.00 a.m.
Meet at the Union Road end of the park ready to plant over nine hundred little plants in the area beside the creek, the alluvial flats! At 12.00 noon there will be coffee, tea, biscuits, drinks and a relaxed chat. Everyone is welcome. Come along wearing appropriate clothes and ready to make a contribution to our lovely park. Our next Sunday working bee will be held on 28th September from 10.00 a.m. to 12 noon. We will be planting the area behind Café Biscotti, on the Verdun Street edge of the park. Meet here at 10.00 a.m wearing sensible clothes and ready for Melbourne's changeable weather. It is our Spring Planting Festival and Adrian has well over one thousand little seedlings for us to plant. Bring your family and friends for a rewarding day and stay for morning tea and a chat afterwards. We had ten people working very hard to plant over one thousand little plants in holes Adrian had dug with his auger. The sun was shining and the park looked really good. The bank at the end of the park below Delta street now has some bluebells, bulbine lilies, lomandras and various other plants filling in the spaces between the existing plants. We all lingered over coffee, tea and biscuits enjoying the sunshine. We had a lovely day for our National Tree Day working bee in South Surrey Park. Many newcomers tried their hand at planting and did a fantastic job. We planted an area just down from the Scout Hall and a small area next to Riversdale Road. Everything was planted by 10:15. We had a great BBQ provided by Boroondara Council. Another large group of planters arrived from Back Creek to share the food. We had a wet but productive working bee in the park today. We spread a large pile of mulch in the planting below Delta Street. The rain eased up toward the end. We had our tea and coffee near the wooden seat. Back Creek is flowing strongly through the park at the moment due to the recent rainfall. Adrian Hotchin from Borooondara Council, a regular working bee attendee, was absent today as he is in Sydney. We have some more interesting news on the reason for his trip there to come!